The Spanish Water Dog is rustic, well proportioned of medium weight. The head is strong and carried with elegance. The Skull is flat with only slight marked occipital crest. Axes of skull and muzzle are parallel. The nostrils well defined. The nose is of the same color or slightly darker than the darkest one of the coat. The lips are well fitting; labial corners well defined. The teeth are well-formed, white, with well developed canines. The eyes are slightly oblique position, very expressive; of a hazel to chestnut color, should harmonize with the color of the coat. The conjunctiva is not apparent. The neck is short, well muscled, without dewlap, well set into the shoulders. The body is robust and the topline straight. The withers are hardly marked and the back is straight and powerful. The croup is slightly sloping. The chest is broad and well-let down-ribs well arched; diameter of thorax ample indicating considerable respiratory capacity. The belly is slightly tucked up. The tail is set at medium height. Docking must be done at the height of the 2nd to the 4th vertebra. Certain subjects show a congenital shortened tail (brachyouria). The forequarters are strong and vertical. The shoulders are well muscled and oblique. The upper arms are sturdy and the elbows are close to the chest and parallel. The forearms are straight and sturdy. The front feet are rounded, toes tight, nails of varied colors, resistant pads. The hundquarters are perfectly vertical with not too pronounced angulations and muscles capable of transmitting to the body a very energetic impulsion and the spring necessary for easy and elegant jumping. The upper thighs are long and well muscled. The skin is supple, fine and well adhering to the body. Can be pigmented brown or black, or be without pigment according to the color of the coat. The same applies to the mucous membranes. The coat is always curly and of woolly texture. Curly when short, can form cords when long. Clipped subjects are admitted; the clipping, always complete and even, must never become and (aesthetic) grooming. The recommended maximum length of the hair for shows is 12 cm (15 cm extending the curl) and minimum is 3 cm to see the quality of the curl. The puppies always are born with curly hair. Colors include white, black and chestnut in their different shades. Bicoloured: White and black or white and brown in their different shades. Tricoloured subjects and black and tan, as well as hazelnut and tan dogs are not admitted. The Spanish Water Dog is an extremely intelligent and well balanced versatile working dog with strong herding, hunting and guardian instincts. He is an exceptional companion, devoted to family, attentive and happy dog, showing strength and stamina combined with unusual agility. He is versatile and easily trained, performing his assigned tasks with competence and dignity. He is reserved with strangers but should not exhibit shyness. Although an authoritative worker, viciousness toward people or animals is intolerable. 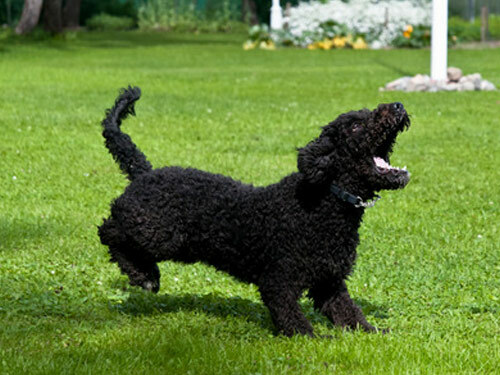 The Spanish Water Dog is a large dog in a medium body. They should be socialized at a young age with people and other small animals. Be sure you are this dogs firm, consistent, confident pack leader to prevent them from becoming protective and territorial. Although they make fine companions and pets, Spanish Water Dogs (as any other dog) should never be left unsupervised with small children. Because of their high intelligence and working drive, they must be kept mentally and physically active doing something. Some of the tasks that the Spanish Water Dogs are used for are search and rescue, bomb detection, narcotics detection, herding, water sports, competitive agility, therapy work. etc.. teams of Spanish Water Dogs as rescue dogs were sent to Turkey, Mexico and Colombia after they experienced earth-quakes. First one must determine what duties the dog will undertake. Will he be used for hunting, water-sports, agility or some other form of work, or will he be a show dog. As a working dog you might want to shear the dog often as the coat will hinder his work in the bush while hunting, the hair will be broken of on the branches in the woods thus causing him to have an un-kept look, however if you shear him down he will always look clean and neat. The SWD is a rustic working dog. The coat of the SWD should never be combed or brushed. When allowed to grow, the coat may form cords. To maintain the coat, bathe only when necessary, using a mild shampoo without heavy conditioners. During the bath, the coat should never be rubbed excessively, the soap should be worked through the coat as if washing a sweater. After the dog is allowed to shake, the coat may be blotted with a towel, never rubbed vigorously. Allow the dog to air dry, or use a crate dryer, never a blow dryer. The coat will naturally mat which is what forms the cords. If the coat becomes excessively matted, the cords can be separated by pulling the mats apart with your fingers down to the skin. For show dogs, the Spanish Water Dog should never be aesthetically groomed. The cords should never be trimmed. The coat should be sheared down at least once a year (or more if you prefer a shorter coat) using a #5 blade on the entire body which leaves 1/4 inch of hair, including the head, and the ears. Once or twice a week one should look behind the ears and the area where he sits and with your fingers separate any cords that might bind together. Bathe as needed, drying takes some time. Consistent minimal work is needed to help develop the proper cording. The Spanish Water Dog does not shed it's coat and is a single coated breed. While this produces less dander, people with severe allergies should use caution. The Spanish Water Dog is a hypo-allergenic dog (meaning LESS allergies) but not a non-allergenic dog. Some people are allergic to the saliva and urine as well as the dander. If there are concerns about allergies, it is recommended that one spends time with the Spanish Water Dog to see if they are indeed allergic.